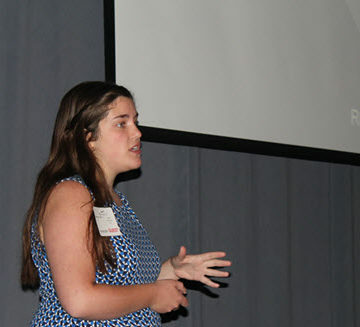 Morgan DiCarlo presents her innovative idea for water conservation to an audience at Walt Disney Imagineering. 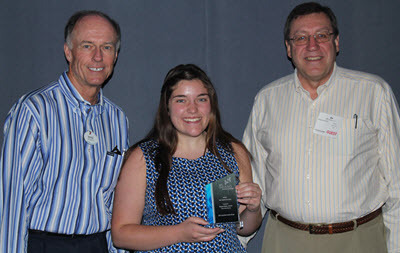 Morgan DiCarlo, S.M.ASCE, channeled her love of water resources management into an idea to encourage conservation so good it earned her an ASCE Innovation Contest prize-winning trip to the Walt Disney Imagineering campus in California. The recent graduate of Stony Brook University from Hudson Valley, NY, shared honors for the contest’s overall Best Student Innovation with Purushottam Gupta of India. Her submittal, “Capitalizing on the Internet of Things to Promote Water Conservation,” highlighted ways in which collecting and sharing of information can affect the psychology behind everyday water usage. She presented the idea to Imagineering engineers during the event for Internet of Things category winners, which also included an exclusive behind-the-scenes tour of the campus and even a chance to talk with an animatronic dinosaur. DiCarlo talked with ASCE News about the Innovation Contest, a passion for water resources that began in high school, and her hopes as she begins postgraduate studies at Virginia Tech this fall. 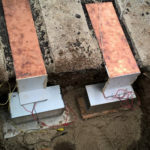 ASCE News: What compelled you to enter the Innovation Contest? You were in the middle of senior year trying to apply to grad school. What made you take on another project? Morgan DiCarlo: I actually began developing this idea as an NSF [National Science Foundation] project, a competition I was already looking into as a funding source for graduate school. I started developing the idea for that and just took it further [for the Innovation Contest]. Also, I did an undergraduate research credit course. My advisor, Harold Walker [Ph.D., P.E., M.ASCE], told me I could do an independent project, and I incorporated this project into my senior year. ASCE News: What was it like when you found out you had received one of the contest awards? DiCarlo: I wanted the opportunity for my idea, which is an application about water conservation, to be recognized. Being selected was such an honor and extremely validating, making me feel confident that I should move forward with this concept. 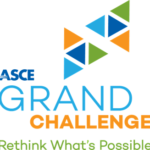 It was exciting that ASCE created this competition and was inclusive of student submissions. I actually love feedback and am a big proponent of adding more conversation and human elements to engineering. This contest was an amazing opportunity for me to get pointers and to generate some dialogue. Even just today there were sparks flying, some people giving me ideas. One woman gave me the name of a programmer she knows. Receiving the award has helped me put fuel behind this idea, get started, and hopefully do something positive. Morgan DiCarlo accepts her award for Best Student Innovation. ASCE News: You gave your presentation today and you’ve got Disney Imagineers watching, some of their top engineers and innovators. What was it like to present in front of such a group? DiCarlo: It was a big deal for me. It was exciting. I felt very comfortable talking about this idea because I’m passionate about it. 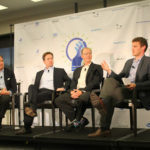 I think I have a unique perspective on water problems because, although the audience were executives and very influential, this is something that I really think my generation needs to get their hands on. We need to start getting active about conserving water. I was in a position to be able to express that with passion, to say, ‘Thank you for giving me this platform, but I want to tell you to start changing wasteful behavior.’ I want people to start paying attention to what’s going to happen in my future. ASCE News: How about the day in general? What are going to take from this experience when you start grad school? DiCarlo: It really blew my mind to see the level of imagination and innovation. Because they’re constructing these imaginary, virtual worlds, they can go so much further. It was really a great setting to have an ASCE event. I’ve been very involved in ASCE [at Stony Brook University], and in some ways civil engineering is a very set profession. It’s the oldest of the engineering professions; we’re the oldest engineering society. And we like our materials, we know how concrete’s made, we know how we like to design suspension bridges and sometimes I think when I look at it from a young perspective it’s hard to make changes in a big way because there are a lot of things that are already set and why fix the wheel? Why change what isn’t broken? But it could be innovated on to make it better. So going into this setting of the imagineers where they have no limits because they’re making their own world, it’s a good way to open up our eyes. It’s the ideal setting for the Innovation Contest, which is trying to change up the world of civil engineering. ASCE News: What about the tour today? DiCarlo: It was really cool to see the detailed modeling behind every resort and attraction. Someone is there doing foam cutouts, sculpting, woodworking, and drawing by hand. The intersectionality of them being an artist and an engineer and a builder, I thought that was amazing. And also I met a dinosaur.